Why didn’t I find a recipe for Jamaican patties from a site other than Martha Stewart? Because the authentic ones looked hard, and the ingredients they had were not readily available. 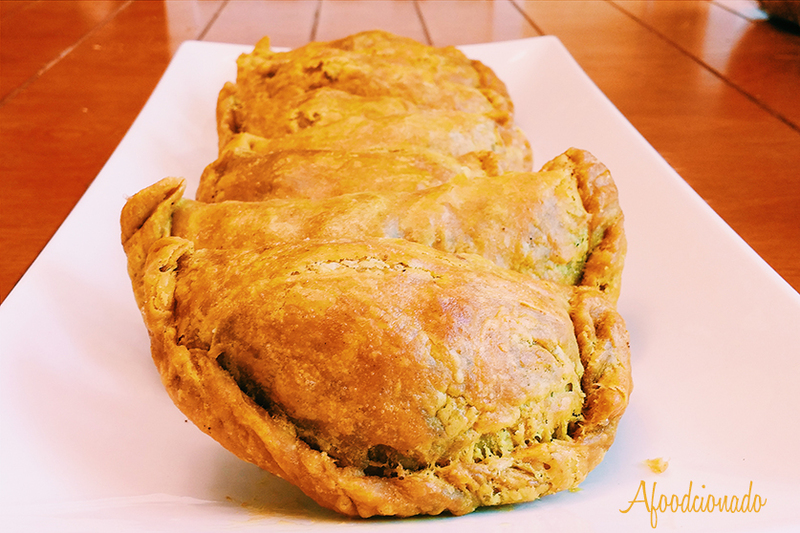 I TURNED TO THE DOMESTIC GODDESS to show me how to make one of my favorite Jamaican treats. I made the dough and the filling, so when you use this recipe you can truly say it is all homemade. 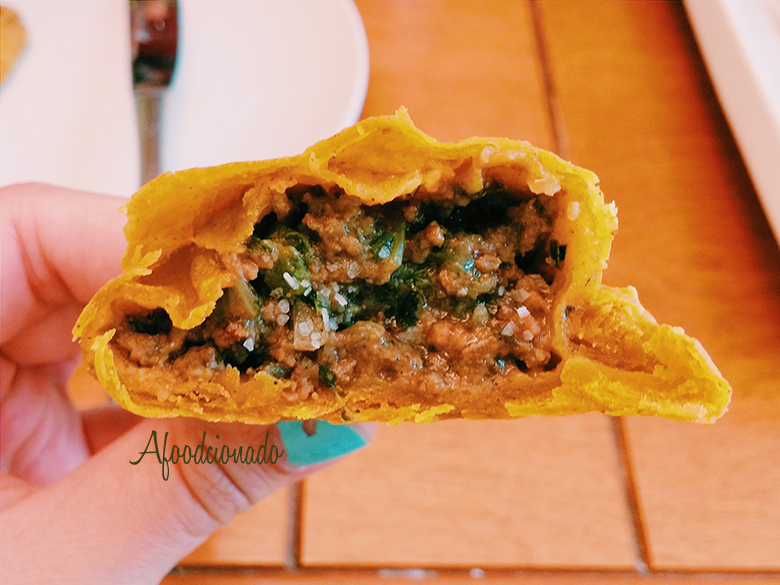 The patties that I’ve had in the past have always been rectangle in shape so when I saw these emapanada looking patties I was a little wary. However, the ingredients were similar to those in the authentic patty recipes give or take a few things. So my tweaks and notes! Instead of 2 tablespoons of curry powder in the dough I used 1 tablespoon of curry powder and 1 tablespoon of tumeric. 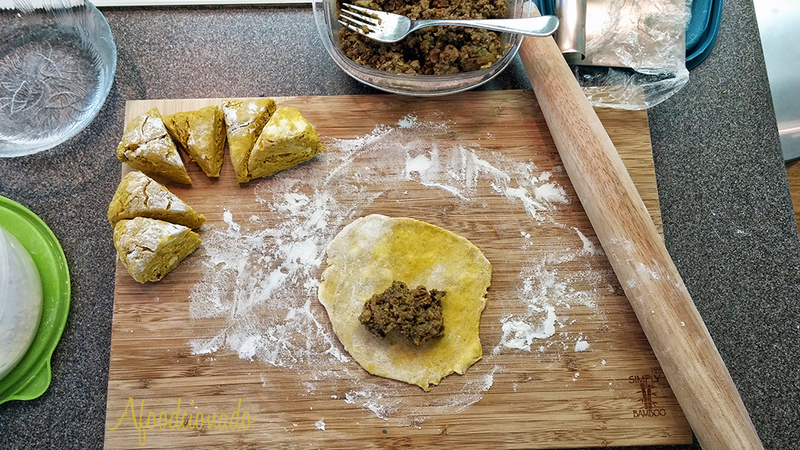 The tumeric gave the signature yellow color AND the Jamaican recipes I saw called for tumeric in their dough. I didn’t have Scotch Bonnet peppers nor did I want to buy 12 of them just to end up using 2. I hate that. Instead, I cut up some dried red peppers and added it to the recipe. Use as much or as little as you like depending on your heat tolerance. I bought a HUGE bag of Korean dried red peppers and they’ve come in handy…you’ll see in future recipes. The filling didn’t taste right after I put everything together…something was missing, and that something for me was cumin! I added about 1 tablespoon of cumin. My filling was a little underseasoned so don’t forget to add salt & pepper!…mainly salt.Of course, season to your taste! 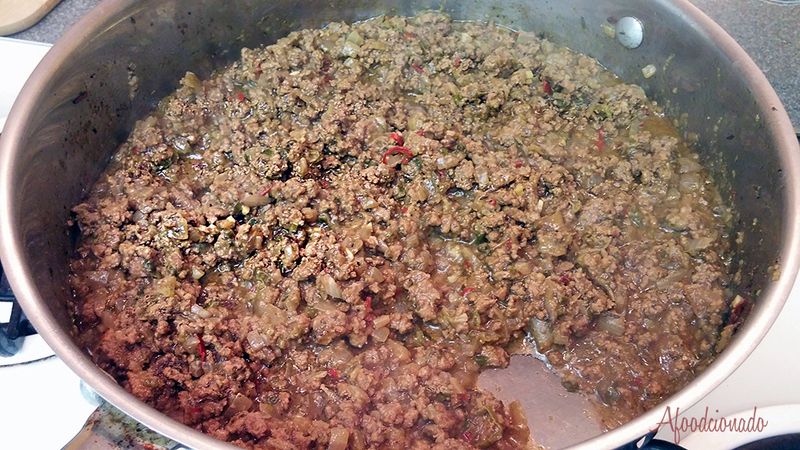 The filling is typically very fragrant and packed full of flavor with a little hit of heat. I wasn’t a huge fan of rolling out the triangle pieces of dough, but whatever. Don’t forget to let it cool! I ended up making 16 patties. No I didn’t double the recipe like I usually do. The packet of meat I used was only slightly above one pound, and it was perfect if you’re a generous filler. The patties were a hit with my boss, coworkers and family! It’s an easy gateway meal if you’re trying to intro people into Jamaican food. YUMM!